We are preparing for our first Winter with a Jeep Wrangler soft top. 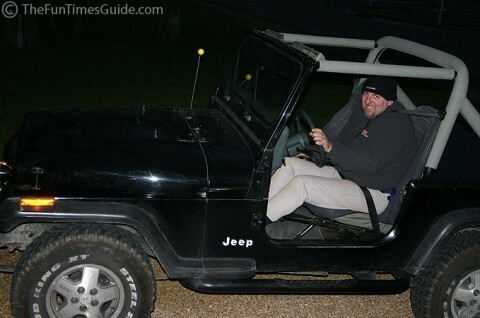 No, staying warm will not be the problem… as with our old Jeep Wrangler, the heater in this one works great! What’s troubling me most at this point is how to remove snow and ice from the vinyl/plastic windows of our soft top when we drive from Tennessee to Ohio and Indiana for the holidays. Our other Jeep Wrangler (the black one) had a hard top. Our new Jeep Wrangler (the silver one) does not. Cold temperatures, ice, and snow can all wreak havoc on a Jeep Wrangler soft top. Don’t raise or lower the soft top when the temperature drops below 41 degrees F. The material is a synthetic which loses some of its resiliency at low temperatures, and it can actually become damaged if it is flexed in too cold temperatures. Never attempt to roll-up the vinyl windows or even open them at the zippers during the winter months. Believe it or not, vinyl Jeep windows can shatter like real glass when they are cold. Don’t try to remove snow or ice from your plastic windows by hand, or by any other means. Before you even touch your vinyl window — from the inside or outside — make sure you’ve given it enough time to warm up and become supple first. Otherwise, you could actually crack the window simply by touching it in very cold temperatures. Never “smack” the plastic windows on your Jeep hoping that the snow and ice will bounce off! 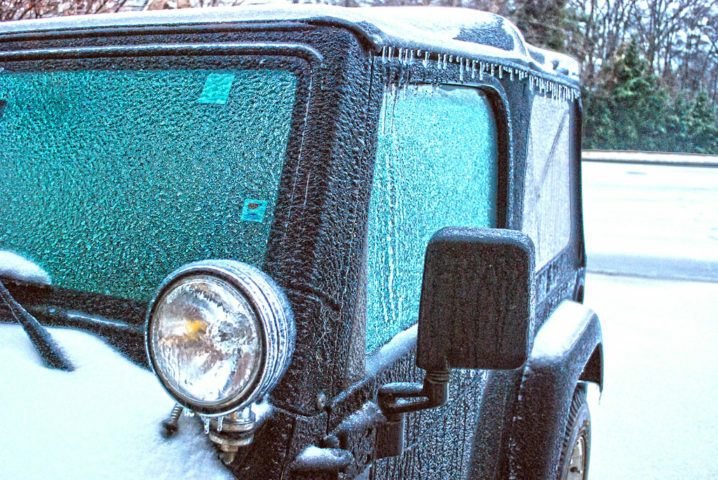 In cold temperatures, never pour water on your Jeep’s vinyl windows in an attempt to remove ice or snow. Your windows may crack. 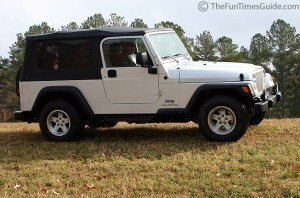 With a soft top, patience is a virtue — especially in the cold, winter months. Ideally, you should just wait for the Jeep’s own heater to warm the vehicle from the inside, causing the snow to slowly melt off naturally. Until the snow/ice thaws and falls off the Jeep windows itself, for side/rear views while driving you may have to rely on the 2 side mirrors — which can be scraped like ‘normal’ car windows. You could use a ceramic heater with a timer, and run it 30 minutes prior getting in the Jeep. The snow and ice will melt off, allowing you to see through your windows as soon as you get in. 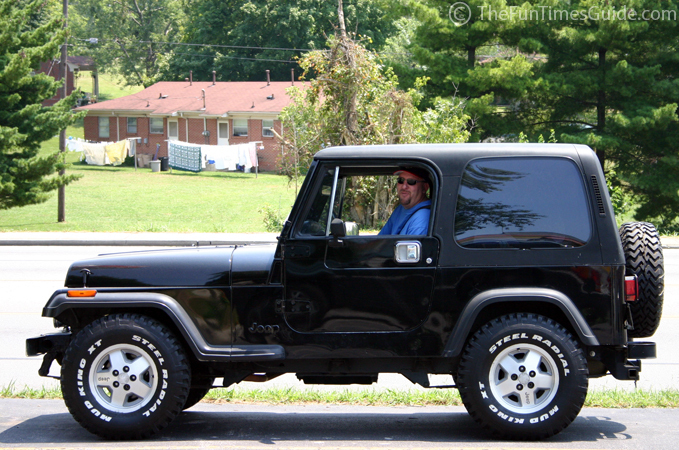 Some people point a hair dryer toward the Jeep’s vinyl windows (but not for too long). However, by the time you’re finished, the Jeep’s own heater would likely have had the same effect — from the inside.